Do you want to learn a new skill, challenge yourself, explore a new area, or just relax in beautiful surroundings, all in the company of other like-minded women? Our Women’s Only Surf, SUP & Yoga Retreat is designed for women ages 25+ who want to experience an exciting, high quality adventure while learning how to surf and paddleboard! You will stay a stone’s throw away from Wrightsville Beach’s white sandy beach at the Shell Island Resort. For your rejuvenating retreat, we will provide all of the equipment needed to enjoy morning and afternoon surf and SUP sessions at Wrightsville Beach, Topsail and Masonboro Island. We will explore and surf several different barrier islands and practice yoga both on the beach and in the comfort of our air conditioned studio. 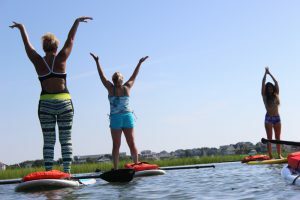 In addition to surfing and yoga sessions, you will experience the feeling of walking on water as you Stand-Up Paddle Board through the backwaters of the Wrightsville Sound. Relax as we provide all local transportation to activities such as a visit to the Karen Beasley Sea Turtle Hospital on Topsail Island. Unwind as we take an amazing boat trip to our day-long surf excursion to the secluded Masonboro Island. Whether you’re an absolute beginner or an intermediate surfer, our staff of professional instructors will take you to the next level with a personalized 3:1 student to instructor ratio. No yoga experience is required; our yoga teacher will guide you through postures that will enhance your strength and flexibility, giving you the perfect foundation for surfing our warm water waves. You work hard all year long, so come spoil yourself with an adventure you will never forget. Bring a friend or come by yourself and see why Surfer Magazine rated Wrightsville Beach, NC one of America’s top 10 surfing towns. This special yoga retreat is limited, so make your reservations now! To learn more about our Women’s Only Surf & Yoga Retreat and how to sign up, click here. The fun begins August 5th.